Chris' Mission Blog!! : Bloggin From Brazil! Well I have made it one full week. This has been the LONGEST week for us noobs!All we do is Eat and Learn portugeuse. The food here is greate. They have tons of different fruits and juices that are really good. We have rice and beans for every meal (except breakfast). The teachers hera are amazing. The portuguese is coming along Great but slow. My companion is Elder Arnold, we get along great, he is from Cedar Hills Utah. The rest of our district is pretty awesome too. We room Elder Eberspacher and Elder Swain. We have 11 total in our district, 6 of us are going to João Pessoa: Elder Arnold (Cedar Hills) E. Eberspacher (Cottonwood) E. Weere (Roy UT) and E. Jensen (Gilbert). Everyone says that 1st, Joao pessoa has weird food like Donkey Head but good fruit and meant and then J. Pessoans have a unique accent so we have to modify our whole learning process. Brazilians!! They are the greatest people in the world. 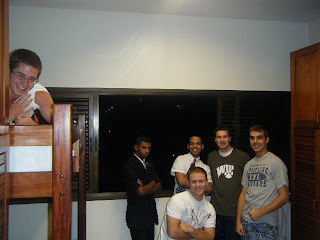 we have already become great friends with Elder Nascimento and Elder Silva they teach us a lot. We offten stay up past curfew and learn from each other. Brazlians are so nice i cant wait to get out into the field! More to come from my mother, hope everyone is doing great! And i love you all, please write me!!! Talk to my mom if you dont know how, oh and send me pictures because brazilians love pictures, well ... im off me and Elder Arnold are going to go shopping!!! Yay. Bye. Can you even believe how great Chris looks. Man, I was so relieved to get his first email today and even happier to have him send a few pictures. Hope you will all continue to check in on Chris's blog as we will both try to keep you updated on his mission activities!! Nice to know you made it to Brazil in one piece and that you are enjoying yourself! Now GET BUSY ELDER! 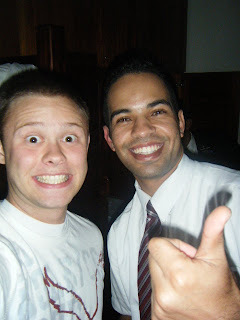 Tell Elder Arnold that he ALMOST lives in the nicest place in Utah County--the nicest being MANILA, of course! So good to hear from you!!! Glad you are doing so well. Keep up the good work Elder! I have never heard of anyone eating donkey heads here. Certainly goat is a delicacy and carne do sol or sun dried meat. I can recommend "Mangai" restaurant in Av Edson Ramalho which has over 40 local dishes on their buffet menu, alas no donkey head. www.paraibaparadise.com a website which has everything about Joao Pessoa.